This is the time of year when those pesky little insects invade our homes in an orderly, single-file line that somehow turns into a full blown attack. When that happens, we want to get rid of them fast! Don’t disturb the ants just yet. They’re too busy to even notice you. First, find out what the ants are after (usually leftover food or spills) and where they are coming from. Look outdoors to identify their entry point into the house. From the inside entry point, spray the line of ants with hot soapy water and wipe up with a sponge. Ants communicate through scent-trails and the soap erases that trail. 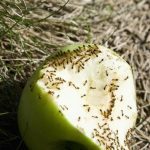 Now the ants are in disarray and don’t know where to go, quickly grab the item the ants are in or on and put it outside in the trash. Clean up the area with more soap and water. Diluted vinegar works well too. Next, temporarily block the entry points, inside and outside, with a smear of petroleum jelly or even a piece of tape. Outside, spray the entry point and general area with soap and water. However, we should focus on preventing the ants from getting inside in the first place. There are safe alternatives to using potentially dangerous pesticides that would be better to use around our family and pets, and would also be better for our surroundings. Avoid leaving food or even dirty dishes out on the counters or in the sink. Clean up crumbs and spills immediately, especially anything with sugar. Don’t leave uneaten pet food out for extended periods of time and always store pet food in an airtight container. Keep landscaping neat and clear of weeds and debris to prevent ant nesting. Caulk any holes or cracks, on baseboards or around pipes, that ants might be coming through. Carefully read and follow the directions. Place ant bait stations containing boric acid in and around your home. Boric acid is minimally toxic to people or animals, but is deadly to ants. If you use spray, more is not better. “Spot” apply, rather than drench entire areas. Avoid applying ant spray when there is rain predicted in the next couple of days. Whether you purchase and apply a pesticide yourself or use a professional pest control company, make sure your sprinkler system is turned off for at least two days following treatment to avoid runoff of polluted water into the storm drain. There has been a problem with excessive amounts of pesticides being washed off properties, into the gutter and into the Santa Clara river. The river helps replenish the local groundwater, which supplies approximately half of our drinking water. 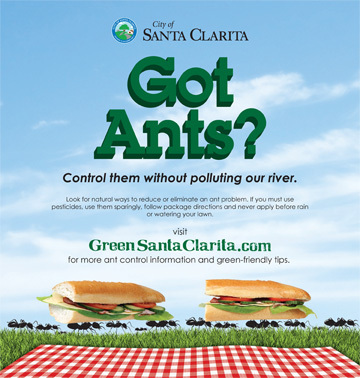 We need to make changes to the way we approach the ant problem, in order to be pollutant free. In addition, you waste money by applying chemicals before it rains or before running your sprinklers because the chemicals wash away without doing their job in the first place. The bottom line…seal up your home to prevent ants from entering and don’t leave anything out for them to want to come in. If you must use chemicals, use them sparingly and don’t let them be washed away. Composting is nature’s way of recycling. It is the biological decomposition of organic debris such as leaves, grass clippings, fruit and vegetable trimmings and other organic material commonly found in the trash. Compost refers to the stable humus or soil-like product of decomposition. Home composting is another way Santa Clarita residents can reduce their waste, save resources and protect valuable landfill space. Composting is the optimum way to turn organic materials into a nutrient-rich soil amendment. Soil conditioned with compost drains better, needs less irrigation and resists surface crusting and erosion. 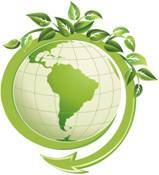 In Santa Clarita, a significant amount of the garbage disposed of annually is organic green waste. To get more information about how you can compost and find out how to attend a free Smart Gardening Workshop, please visit www.smartgardening.com. The trails are calling for you! Explore more than 60 miles of picturesque trails and paseos in Santa Clarita designed for commuting and recreational use, including walking, running, biking, and skating. Help reduce carbon emissions, traffic, and your gasoline costs by utilizing our local trail system. Take the extra step to go green when you clean by using eco-friendly cleaning products and finding a new life for items you no longer need. Many common cleaning products are hazardous to the environment when flushed or thrown away and, according to the Environmental Protection Agency (EPA), fumes from household cleansers and other products may make indoor air in the typical home two to five times more polluted than the air outside. Today, many cleaning products have reduced toxins and are made with natural ingredients. And you don’t need to go to a specialty store to get them. Many of these less harmful cleaning products can be found at your local grocery store or retail chain. Baking soda can be used as a gentle, non-abrasive cleaner for kitchen counter tops, sinks, bathtubs, ovens, and fiberglass. It is a useful air freshener and carpet deodorizer. Because it neutralizes or absorbs odor, baking soda can also be added to litter boxes, left open in the refrigerator or freezer, or included with laundry detergent. When white vinegar is mixed in equal parts with salt, it removes mildew, and added to water it is a good floor cleaner. Used straight, white vinegar can remove stains from the coffee pot, and is a good fabric softener. Don’t Trash It, Donate It! Before you recycle or trash any unwanted items, see if they can be reused. Whether it’s clothing, sporting goods, furniture or even a car, your discarded items could be the key to brightening someone else’s day. Check with your favorite charities or local thrift shops to see if they can put your donated items to good use. If you would like suggestions on local donation resources, submit a request through our Resident Service Center under the other trash and recycling category. Most of us don’t think much about how food and water are connected. Click on the link below to view a guide that will walk you through the process to make it all make sense.